Swanton Abbott is a small parish situated some 6.5km north of Coltishall and 10km from the coast. The parish is part of the North Norfolk Local Government District, and has an area of almost 475 hectares. The name ‘Swanton’ is thought to derive from the Old English for herdsman’s enclosure, and the name ‘Abbott’ is thought to refer to the fact that the parish belonged to St Benet’s of Holm Abbey (NHER 5199) at Horning. The earliest objects are a small number of Neolithic flint flakes (NHER 33634), followed by two Bronze Age socketed axeheads (NHER 7576, NHER 39264). Unfortunately no prehistoric or Roman period monuments have been recorded, however a small number of Roman pottery sherds (NHER 24066, 37251 and 45442) coins (NHER 24160, 24592 and 42582) and a Roman nail cleaner (NHER 50080) have been found. 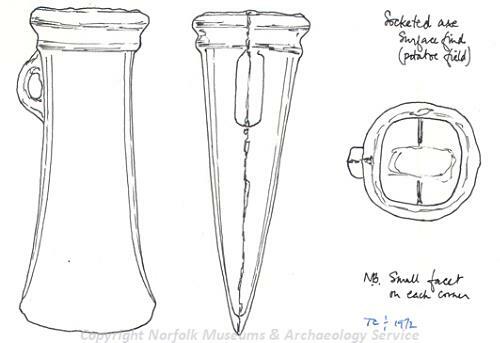 A small number of Saxon objects have also been recovered, comprising pottery sherds (NHER 24160), a stirrup-fitting fragment (NHER 37668), a possible Saxon strap end (NHER 50080), and a Late Saxon finger ring (NHER 33634). No Saxon period monuments have been recorded, although the parish does appear in the Domesday Book. The earliest monument in the parish is therefore the church of St Michael (NHER 7584), which has a 14th century west tower and a number of 15th century painted panels inside, as well as a 13th century iron-plated south door. The only other building that may be dated to the medieval period is Wilson’s Farm (NHER 19454), a house which appears to date to the 17th century, with a 19th century brick skin, and which may have had its origins in a late medieval hall house. A small number of medieval objects have been recovered, and these include a number of pottery sherds (NHER 22632, NHER 24066), as well as metal objects such as brooches (NHER 35021), buckles (NHER 33634), coins (NHER 37668, NHER 45442) and nails (NHER 24160). A silvered horse harness pendant with red enamel work has also been recovered (NHER 50080). A similar range of objects from the post medieval period has also been found, as well as a silver seal matrix (NHER 28720). One of the most interesting buildings in the parish is Swanton Abbott Hall (NHER 22714), built around 1600 and altered in the 19th century. This two storey building has two polygonal chimney stacks, and sits within parkland thought to have been laid out around 1710. Also of architectural interest are Dairy Farm (NHER 14004), a timber-framed house of around 1600 which may have been used for weaving, and Old Manor Farm (NHER 14006), an L-shaped building also thought to date to around 1600. From more recent history, the crash site of a World War Two Manchester aircraft has been recorded (NHER 14442).